Last Saturday I made a special point to attend the cooking class at Grace-Marie’s Kitchen because she was making Paella, which I have tried to make a couple of times, but wasn’t happy with the results. 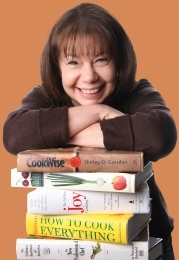 Grace-Marie’s recipes are always so well done and delicious, so I was really looking forward to seeing how she made it. And my confidence in her was again rewarded and the Paella was fantastic. Our luncheon also included Valencia Salad with Catalan Tomato Bread and Sangria Glazed Caramelized Pears with Honey Almond Cream. Now, don’t you wish you had been there? Grace-Marie started off sautéing the cubed chicken thighs and sliced rounds of chorizo until they were lightly caramelized, then set aside on a pan until ready to add to the final paella. We were told not to wash the pan, because all that good chorizo flavor would be cooked in with the Sofrito to be made next. 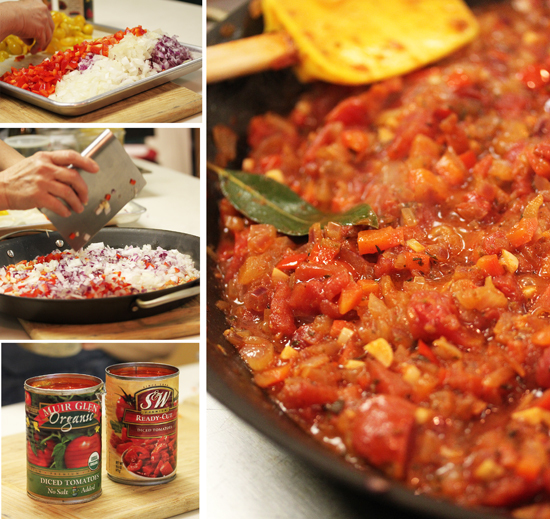 The Sofrito, which is the flavoring, similar to mirepoix and serving the same function, was now added to the pan. The onions, peppers and garlic were sautéed in oil until tender and then the tomatoes with juice, thyme, oregano, cumin, paprika and bay leaf were added. The mixture was brought to a boil, reduced to a simmer and cooked, uncovered until thickened and slightly caramelized. When the Sofrito was cooked to the desired consistency, the uncooked rice was added and stirred to completely coat each grain. Dry white wine was added and cooked until absorbed. Simmering chicken stock with saffron and turmeric was poured over and was cooked for about 10 minutes to partially cook the rice. The reserved chicken and chorizo was folded into the rice. Grace-Marie said this was the point where you make a judgment call as to whether you need to add more stock, and she did. Grace-Marie included some halibut also, but she said any firm white fish, such as Talapia, would be fine. At this point all of the ingredients were in the paella pan and it was put in the oven to bake, uncovered, until the rice was tender, about 20 to 40 minutes. The length of time to finish cooking the rice would depend on what type you are using. The recipe included this advice: If the rice is not done after 20 minutes, drizzle 1-2 cups of stock over the rice, scatter tomatoes and beans (or peas) over the top and bake until the rice is tender and the bottom is crusty (10+ minutes). To serve, the Paella had sliced green onions scattered over the top and wedges of lemon inserted into the rice around the edges. 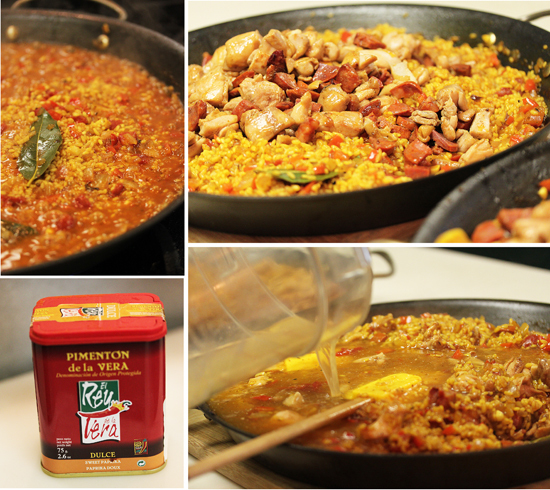 I gave my plate of beautiful Paella a generous squeeze of lemon juice all over and it was divine. Thank you Grace-Marie for showing me how to make Paella! 1. 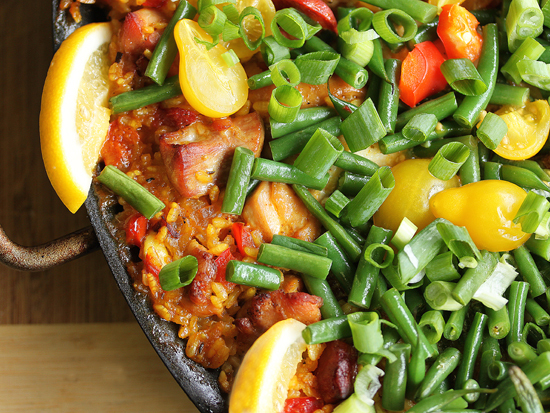 Warm the oil in a medium size (16-inch) Paella pan (or wide stovetop to oven skillet) over medium heat. 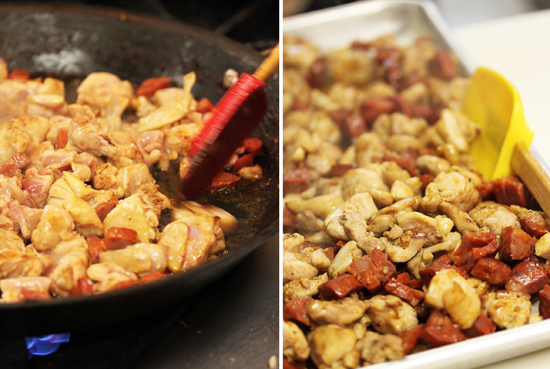 Add the chicken and sausage and cook until lightly caramelized. No need to season as the sausage will do the trick! Transfer to a bowl until ready to add to final paella. DO NOT CLEAN THE PAN. 1. Add the olive oil to the paella pan and warm over medium heat. Stir in the onions, peppers and garlic until tender (5 minutes). 2. Add the tomatoes with juice, thyme, oregano, cumin, paprika and bay leaf. Bring to a boil, reduce to simmer and cook, uncovered, stirring, until thickened and slightly caramelized (10 minutes). 1. In a sauce pan, heat the chicken stock, saffron threads and turmeric and bring to a simmer. 2. 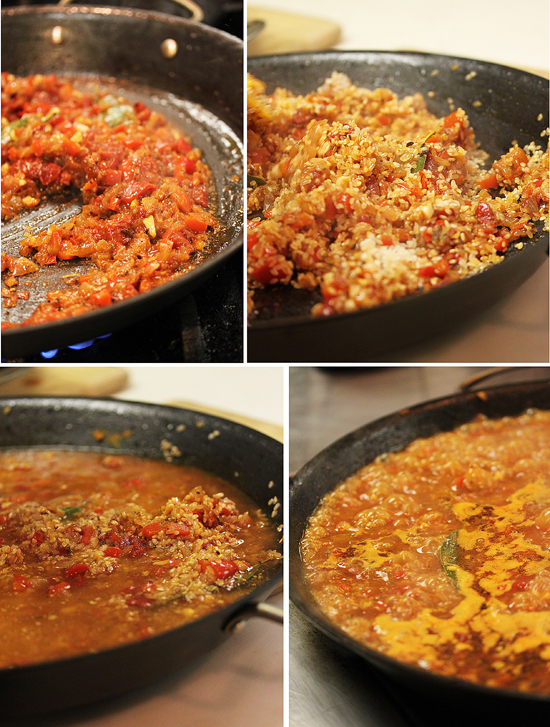 Stir the rice into warm sofrito in the paella pan until coated well. Add wine and cook until absorbed. 3. Add 6 cups simmering chicken stock, bring to a boil, reduce to a simmer and cook, uncovered, for 10 minutes. 2. Nestle chicken, sausage and seafood into the rice. Set pan on lowest oven shelf. Bake, uncovered, until rice is tender and seafood cooked (20 minutes). 3. If rice is not cooked, drizzle 1-2 cups of stock over the rice, scatter tomatoes and beans (or peas) over the top and bake until the rice is tender and the bottom is crusty (10+ minutes). 1. Scatter green onions over top of paella. Garnish with lemon wedges around pan. Serve. That looks so good.. I don’t think I ever had a paella with fish. Is that common? Since I love the pasta with chicken and sausage from Bristol Farms before I am afraid I may be making this one over and over too. Have never heard of baking paella. Thought it was always cooked solely on the stove top. But from your lovely pics, it looked like she knew what she was doing! Ohh so paella is kind of like a risotto? Rice freaks me out, I always use instant since I’m so afraid of over/under cooking! wow! does that look spectacular!!! the colors and depth of flavor, i can only imagine the smells as that was cooking. 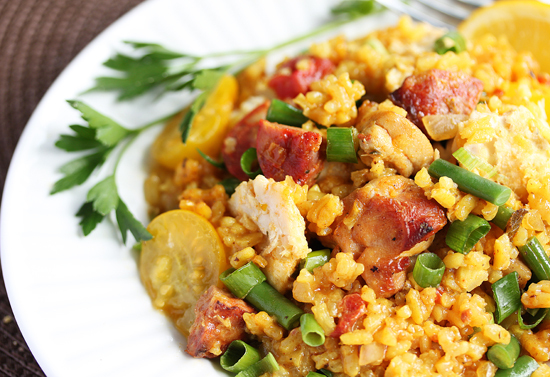 Hi Lynne, Your Sizzlin’ Spanish Paella with Chicken and Chorizo recipe has been selected to be featured in a Recipe Guessing Game. Please share the following link with your friends and fans. To play, go here: http://knapkins.com/guess_games/196?source=blog Congrats again! !